ChordPulse portable is an easy-to-use virtual band that is great for practising, improvisation, inspiration and just having lots of fun with music. You can use it as a full accompaniment, a drum machine with bass, a metronome with chords, and more. Play and sing along with ChordPulse, experiment with musical ideas, styles, and chords in no time. Test your fantasy by playing along with different music styles and chord progressions. Use ChordPulse as a configurable background. Play or sing along for your own enjoyment. Relax with a delicate ballad, recharge with some blues, or raise your pulse with rock & roll. • Enjoy your music practice. • Be inspired as a songwriter: experiment with styles and chord progressions. 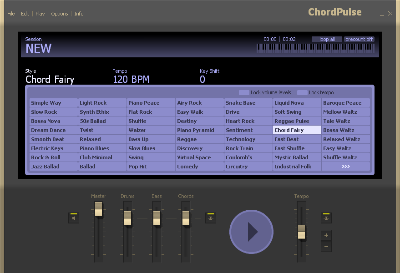 • Use ChordPulse for improvisations. Relax and recharge. • Test & improve your playing techniques as an instrument player. • Test & improve your accuracy and intonation as a singer. • Test & improve your timing in general. • Test & improve your versatility with various music styles. • Try different styles, tempos and keys instantly. • Create a fun band with friends and use ChordPulse as the base. • Motivate children to practice more. • Receive new music styles for free!